Already the drums have starting beating for the head of Sydney FC head coach Ian Crook after the Sky Blues were humiliated 7-2 by the Central Coast Mariners. Twitter was abuzz on Saturday night after the record-breaking defeat, Sydney FC’s largest-ever loss, and what many have viewed as a disappointing start to the A-League season. At the moment the Sky Blues sit in sixth place on the ladder, with six points, after two wins and three losses. They are three points ahead of bottom-placed Melbourne Victory and six points off leaders Adelaide United. So far they have managed a disappointing season-opening 2-0 loss away at Wellington, a 3-2 loss at home to Newcastle, a close 1-0 derby win over the Wanderers, thanks to an Alessandro Del Piero goal, a somewhat fortunate 2-1 victory over Perth and the heavy defeat at Bluetongue Stadium. 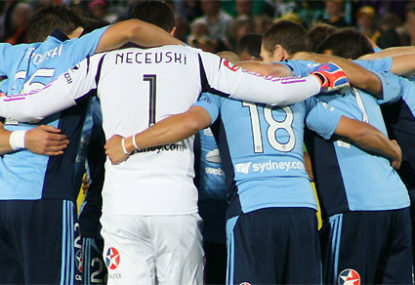 Apart from the brilliance of Del Piero and some patches of quality, Sydney FC has largely flattered to deceive. Football is a game of margins and they have ridden their luck to get six points, holding on against Western Sydney and Perth failing to get a late penalty shout for handball at ANZ Stadium. Victory may be the A-League’s biggest club but the Sky Blues are the glamour club, ‘Bling FC’, who reside in Australia’s biggest city and the biggest media market. The pressure and attention the club receives immense, and this has only quadrupled since the arrival of the Azzurri great. Every team wants to perform against the glamour side and every team wants to beat the Del Piero-led Sky Blues. There will be no easy games at the likes of North Queensland and Gold Coast this season. Adding to this is the new tenure of Ian Crook. The former Newcastle, American Samoa, Norwich and NSWIS coach has only been in the hot seat since May and hasn’t had long to work with his team. Sydney FC were recruiting, granted along with a lot of other teams, right up until opening day and the arrival of the Italian maestro has changed the dynamic of the team. Some people forget that it is virtually a whole new first-team squad the Sky Blues have this season, compared with the team of 2011/2012. No other A-League squad, apart from perhaps Gary van Egmond’s Jets, has had as much change. In has came Fabio, Alia Abbas, Yairo Yau, Krunoslav Lovrek, Adam Griffiths, Vedran Janjetović, Trent McClenahan, Paul Reid, Jason Culina and Del Piero. Out has gone Liam Reddy, Jamie Coyne, Michael Beauchamp, Bruno Cazarine, Shannon Cole, Juho Makela, Mark Bridge and Scott Jamieson. A whole raft of young talent has also been promoted from the youth talent. This amount of player turnover means it will take time to get things right. Injuries to Pascal Bosschaart, Griffiths and Fabio have also not helped. Crook’s first-choice defence, apart from Ivan Necevski, has hardly been available for selection. Sydney FC’s frailty at the back and organisation has been their biggest problem. Kids like Daniel Petkovski and Hagi Gligor have been forced to play big minutes, with Terry Antonis away on Young Socceroo duty. But the Sky Blues have too much quality for things not to go right. With Culina back to full fitness and the likes of Emerton and Del Piero firing, Sydney FC have a lot of class. There have been other bright spots as well – the form of Ali Abbas has been inspiring and Yairo Yau looks a likely player who will command more minutes. Some have said Sydney FC need a ‘big-name’ manager and Crook is not up to the task. I disagree. The 49-year old Englishman and former NSL Coach of the Year has the tools and the experience to get the job done. The Sky Blues need more matches under their belt and more work on the training pitch, as well as some fit bodies, to get things right. A new central defender in the January transfer window may be required too. The A-League is won in April, not November, and I’m picking Sydney FC to be in the top six come finals time.